The focus in autumn is reaching average pasture cover and cow condition targets ready for spring. Where practical and economic this should include keeping cows in milk where body condition is adequate. Build APC by increasing rotation length. Good grazing management through early autumn is maximising the pasture you grow and utilise, balanced with allowing pastures to recover following any dry periods in the summer. The secret to achieving this good grazing management is leaving consistent post-grazing residuals and graze pastures at the right time (2.5-3 leaves). Grazing ryegrass pastures too early reduces autumn growth and too late reduces quality. Grazing at the 2½ - to 3-leaf stage. During May, the rotation length may be extended beyond this to start building feed for winter. Preventing grazing below 7 clicks/1500 kg DM/ha. Frequent intense grazing before plants reach the three leaf stage reduces recovery of tiller numbers during autumn. It is important to determine the leaf stage of your own pastures. Leaf appearance rates mainly depend on temperature and water availability with leaves taking longer to appear in colder temperatures or where water is limited. The following table shows the approximate leaf appearance rates for different regions in autumn; this can be used as a guide to determine rotation length. To determine the leaf stage of your own pasture, collect 10 tillers and compare the leaf stages with the grazing pocket guide pages 10 & 11. Adapted from Julia Lee et al., DNZ Technical Series Issue 3. Assumes that available soil moisture is at minimum 40%, if less than 40% time taken for a leaf to fully grow will increase dramatically. This is a guide actual rate will vary with temperature and water. If farm cover is below where is should be (in order to meet target cover at calving) N fertiliser can be a great ‘circuit breaker’ to get growth back on track. Use a large part of the farm for best effect. Whole herd body condition score (BCS) assessment is a powerful tool to assist proactive feed management during autumn and to sort mobs of cows for differential feeding during winter. To manage calving BCS targets, the herd must be assessed in early March. There are a number of strategies managers can use to get every cow close to her ideal BCS at calving. From early March, OAD milking and feeding milker’s supplements are not effective ways to gain BCS in early-calving cows. To hit targets, cows need to be dried-off based on their individual BCS, their approximate calving date, and the amount of supplementary feed available for autumn feeding. For later-calving cows, OAD milking and supplementary feeds can form a part of the strategy for BCS management. But the time taken to gain the necessary BCS must be considered. Particular attention must be paid to R2s and heifers finishing their first lactation. An autumn feed budget can be used to reflect on the current feed supply and demand situation, and plan ahead to reach cow condition and pasture cover targets. Using N to boost autumn pasture growth. If you are planning to renew poor performing pastures firstly identify the poor performing paddocks for renewal and address the underlining problems behind pasture deterioration. Consider soil fertility and pH, over-grazing, pugging, drainage, soil compaction, weeds and pests. For areas north of Taupo, the recommended renewal date is March 31 and for the lower North Island around March 20. If permanent pasture is following crop consider the time for full crop utilisation and the renewal process. Sowing a small area well is less risky than sowing a large area poorly. Attention to weed control, contouring and levelling if avoiding cultivation after forage crops. New pastures should first be grazed when the plants break off rather than pulled out when plucked by hand. Use the pluck test to test when to graze. The first grazing should be a quick nip off with (top 2-3cm) with young stock or 2-3 hours grazing with cows. Before 1st grazing it may pay to test a sample for nitrate toxicity – Nitrate poisoning is not uncommon when grazing resown pastures especially annuals. Weed control - spray new pastures. Monitor your new pasture for weeds, seedlings weeds can be sprayed before or after 1st grazing. Spraying should be delayed if there is more than 50% bare ground. Waiting for all clover plants to be big enough to spray means that weeds are often to advance to control. Cause of autumn damage, yellowing tillers that pull easily from the pasture. Stunt plant growth Transmit plant viruses. Autumn sprays as directed by your consultant or industry representative. Removal of weeds that can act as host. 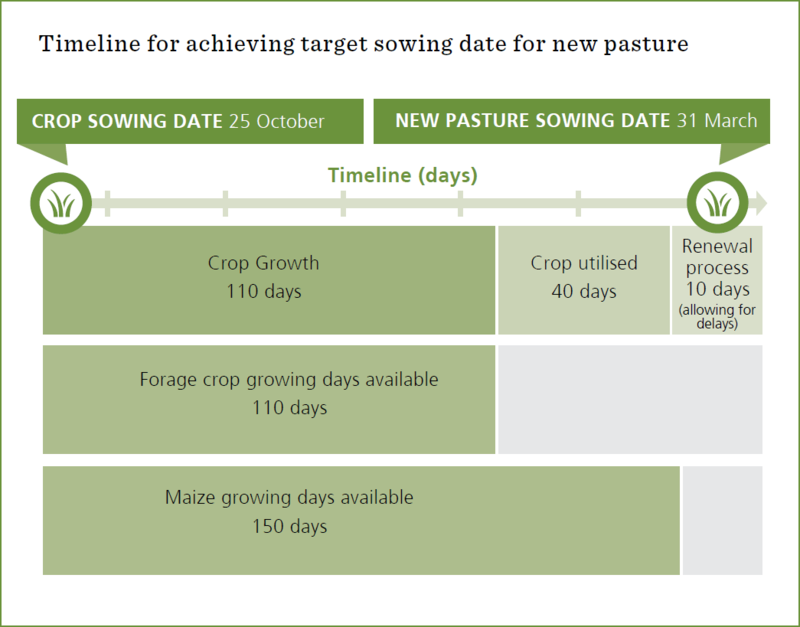 Throughout NZ Clover Pasture establishment application of insecticide can be used close to seedling emergence to control adults, provides a window in which clover plants may establish before re-invasion . Feed on roots. Densities greater than an average of 8 larvae per spade square (200/m2) will cause damage. Insecticidal control against adult weevils returning to Lucerne at the end of autumn. Insecticidal control should only be used when damage is severe. Throughout NZ, damaging populations uncommon in northern North Island Porina occurs in most pastures. Whether or not they attain pest status is largely governed by weather at key times of their life cycle No of different species require different assessment - Agpest for appropriate autumn management and control. Autumn sown brassica crops and legume seedlings can be severely damaged as larvae sever plant stems and the plants will die. Northern North Island, Hawkes Bay, coastal Taranaki, Marlborough and the Canterbury plains Most pasture plants, pasture weeds and brassica seedlings. Favour legumes incl. clovers and Lucerne. Larvae in the soil in autumn. When larvae are present at damaging levels insecticide may be the only recourse to limit damage and save pasture. Maintaining good pasture cover during January/February reduces the availability of egg laying sites. For more information on identification and control check out AgPest. Completing the simple will identify any shortage in home-grown feed and therefore determine if supplementary feed is needed. This calculator can be used to help make decisions on purchasing supplement to feed to dry cows for live weight gain. Calculate the wastage of supplement, the return from supplement in Autumn and the profitability of purchasing feed to extend lactation. Winter management is about setting pasture up for spring and protecting pastures from pugging. March is the time to start focusing on calving, particulary assessing how to manage your herd’s body condition score (BCS).